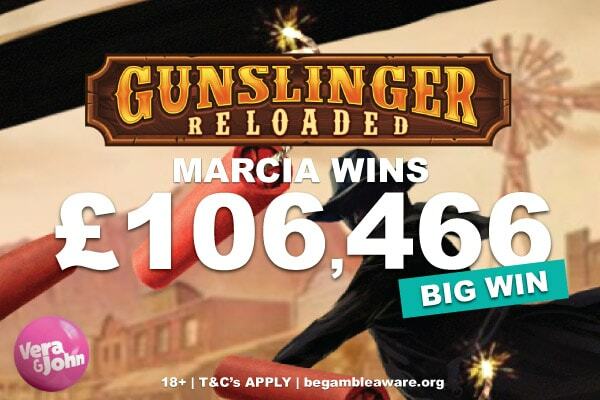 We head to the Wild Wild West of Brazil where Marcia couldn’t believe here eyes when she decided to try her luck on the Play’n GO Gunslinger Reloaded slot machine. Her lucky day started when she logged in to her Vera&John online casino account. It was a day that Marcia will remember for the rest of her life as her decision to play one of Play’n GO’s progressive jackpot slots took a lucky turn. And we say lucky cause there’s no guaranteed way to win a jackpot other than to play for real money. Which is exactly what Marcia did. Here’s her story, her reaction to her huge slot win and what she plans on doing with her over £100,000 in cash. Oh yeah, and we’ll give you a few insights in to the winning Gunslinger Reloaded game. A day like any other, Marcia logged in to her account and took a look at the slot games on offer. She hadn’t heard of the Gunslinger Reloaded slot before but as soon as she saw it had a progressive jackpot attached she decided to give it a spin. And why not, when those jackpot totals reach a decent amount it’s worth giving them a few spins to see if Lady Luck will be on your side. Obviously don’t go chasing them cause that’s when you get in to trouble, but much like playing the lottery a few choice bets here and there and a little magic later and you could see yourself with a big chunk of change in your pocket. If you’re in Brazil, New Zealand, Canada or Europe and are reading this big winner news post then you’re probably trying to do the conversion from Pounds in your head, and much like us failing miserably. That’s a whole load of cash no matter where in the world you’re from that’s for sure. We head to the wild west, where shoot outs are common, bounty hunts are the norm and free spins wins are doubled. The Gunslinger Reloaded slot machine is a 5 reel, 25 payline game by Play’n GO featuring 96.67% return to player rate, medium volatility and free spins with 2x win multipliers. It’s full of action thanks to a Bounty Hunt Bonus where if you pick the right outlaws they can reward you with up to 4x multipliers and up to 240x your bet wins. And then there’s that progressive jackpot which is tied in to the Shoot Your Cards feature. Trigger this feature and you’ll get a straight shoot out for your chance to win the jackpot prize which ranges from 50,000 upwards of 100,000 or so. It’s not the biggest jackpot slot prize out there, that tends to go to the popular Microgaming Mega Moolah slot or NetEnt’s Mega Fortune Dreams. But ask Marcia if she cares how big those other two are after winning her 100K fortune. What does Marcia plan on doing with her casino winnings? We love to find out what the latest casino winners will be spending their money on. Whether they’ve won a few tens of thousands, 100K or millions it gives us inspiration to hopefully be the next winner. So what does Vera&John casino’s lucky Brazilian plan on doing with her over 500,000 Brazilian Real? Well, like many, she’s planning on a luxury holiday to a paradise island on a well deserved break from real life. But not one to spend everything at once she also plans on using some of the money on a few choice investments to hopefully help that win grow even more. A well-balanced choice and one we thoroughly applaud. The casino where Marcia won is a long time favourite of ours, we don’t currently have a casino review here on SlotSumo.com but don’t worry it’ll be coming soon. In the meantime you can either head over there and take a look at what this friendly and entertaining casino site has to offer or read our few top things to look out for. 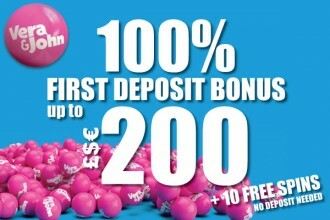 It essentially has everything you need if you’re looking for the newest slot games to play or a new casino to try out. Read our Vera and John casino review or head over there and see if this colourful casino and its games will be lighting up your casino balance anytime soon.